A few years ago, it became obvious to food pantries and organizations like City Harvest that it wasn’t enough to just give food away. They needed to give people healthy food. People in low-income neighborhoods have high levels of obesity, heart disease, and diabetes, at least partly because they can’t afford fresh fruits and vegetables. 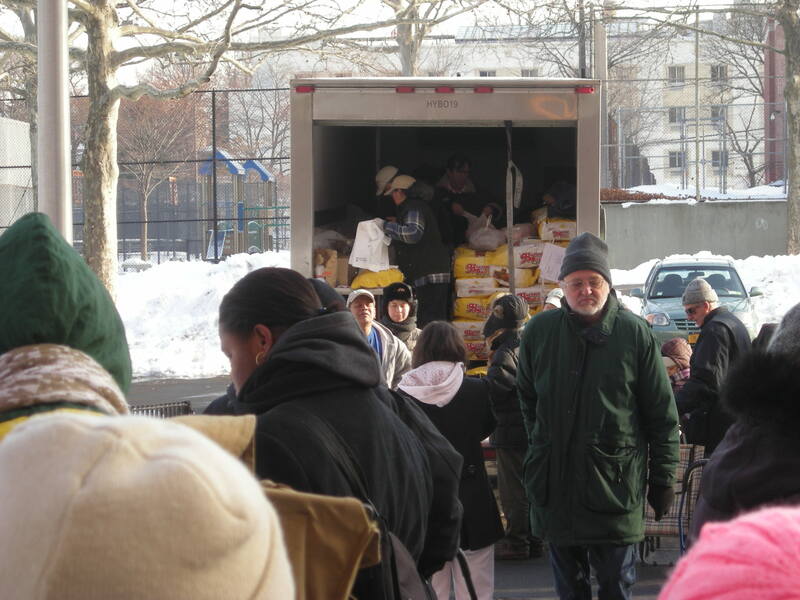 The Mobile Market at the Stapleton Houses in January 2011. Russian-speaking volunteer (and founder of Software Management News) Nicholas Zvegintzov faces the camera. City Harvest now delivers hundreds of pound of free fruits and vegetables twice a month to Melrose in the Bronx; Bed-Stuy in Brooklyn; and Stapleton on Staten Island. They also promote good nutrition in local schools, do healthy cooking classes and demos, sponsor health screenings and outreach, and work with “Healthy Corner Stores” that agree to sell at least a dozen types of produce. However, researchers seem to have found another wrinkle in what makes a neighborhood unhealthy. In the “The Poverty Clinic” (New Yorker, March 21, 2011), Paul Tough writes about the Adverse Childhood Experience (ACE) study that assessed the health of patients enrolled in California’s Kaiser HMO between 1994 and 1998. At the same time as the researchers tracked health outcomes, they also surveyed their clients about ten adverse childhood experiences such as parental divorce, physical and sexual abuse, emotional neglect, and violence in their homes and schools. The results were scary. The higher the ACE score, the worse the outcome. Compared to people with no history of ACEs, people with ACE scores of four or higher were twice as likely to smoke, to have been diagnosed with cancer, and to have heart disease. Even more scary: Patients with ACE scores of seven or higher who didn’t smoke, didn’t drink to excess, and weren’t overweight still had a risk for ischemic heart disease that was 360 percent higher than for patients with zero scores. Not all researchers agree that traumatic childhood experiences and later poor health correlate as strongly as the studies seem to show, says Tough. However, it’s something to keep in mind when healthy-food advocates try to measure how their interventions affect the health of a child, a family, or a neighborhood. This entry was posted on April 25, 2011 at 7:46 pm and is filed under neighborhood, social services, Staten Island. You can follow any responses to this entry through the RSS 2.0 feed. You can leave a response, or trackback from your own site.